Last night at the XIII BrazilFoundation Gala New York supporters raised US$500,000 for initiatives and projects that promote a better Rio de Janeiro. The gala kicked off with a lively performance by upcoming carioca funk phenomenon Dream Team do Passinho, composed of five youths from the favelas of Rio itself. Later in the evening, accompanied by DJ Gaspar Muniz, the group would call all guests on stage to dance and sing alongside them, leaving everyone – whether a carioca or only carioca-at-heart – in the celebratory spirit. Fernanda Lima and Pedro Andrade, a native of Rio, were the masters of ceremony for the gala. Model Luciana Curtis, a supporter of the Foundation for 13 years, and Amigo Gringo presenter and NY Times columnist Seth Kugel led the auction. “Eversince I began working with BrazilFoundation, I’ve seen an organization that really does what they say. I’ve already visited several projects and have seen a difference that the Foundation has made in the lives of the people it helps”, said Luciana. The world’s eyes will be on Rio de Janeiro as it prepares to host the Summer Olympics in 2016, creating unprecedented opportunities to mobilize the international community around projects and institutions in Rio that work to improve the quality of life for thousands. In this spirit, BrazilFoundation officially launched the “ALL FOR RIO” campaign on the night of the gala. The night was an opportune moment to honor the people and institutions who have helped the Foundation reach its goals over the last 15 years. 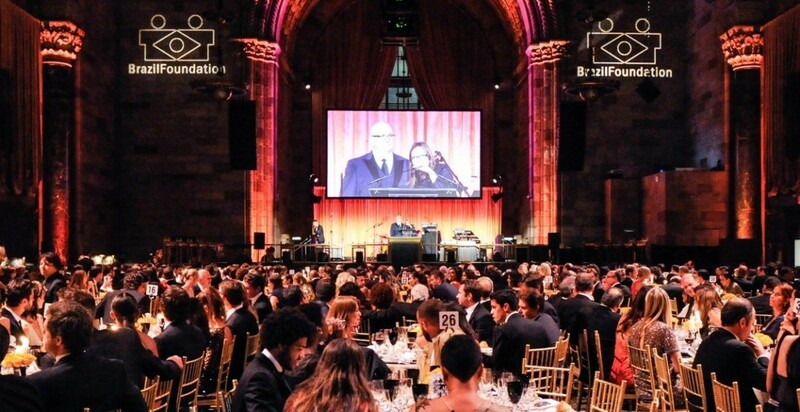 Andrea Dellal, CHAIR of the IX BrazilFoundation Gala New York in 2011, an event that raised more than US$1.5 million, was one of the night’s honorees. Since 2011, Ms. Dellal has been a dedicated supporter of the Foundation, visiting projects and meeting social leaders. Even though living outside of Brazil for some years, she maintains strong ties with Brazil and its social causes. “Although I have lived abroad for most of my life, I, like most Brazilians am incredibly proud of my country and maintain very deep roots .However, on my frequent visits to Rio de Janeiro where I’m from, I am constantly reminded of the inequality and the injustice suffered by most people… I believe BrazilFoundation makes a difference and so can all of us tonight!” Andrea Dellal stated upon receiving her award. A Carioca at heart, Frenchman Pierre Lacaze, CEO of LCM Commodities, was also honored. Pierre has been the biggest supporter of the BrazilFoundation Carioca Fund for the past four years. With his support, the Foundation has been able to invest in eight organizations in Rio de Janeiro that offer professional training to help youth enter the workforce. LCM Commodities also sponsored urban art and photography competitions in 2011 and 2012 for 32 youths from communities throughout Rio de Janeiro. BrazilFoundation presented the International Philanthropy Award to WITNESS, an organization co-founded by Peter Gabriel in 1992 that trains and supports activists and citizens throughout the world in the use of video to promote and defend human rights. Active in Brazil since 2006, WITNESS is a partner of Coletivo Papo Reto, a BrazilFoundation grantee this year. The collective defends the human rights and security of residents of Complexo do Alemão de Penha, in Rio de Janeiro, and was present at the Gala to receive the award alongside WITNESS. “We can change this situation. You all can change this. That’s why we are here tonight…to tell youth that instead of picking up guns, that they can instead pick up cameras or ballet slippers. May the gunfights that they hear everyday in Complexo do Alemão instead one day become the applause that we are hearing here tonight. Respect the favelas!” stated Raull Santiago, of Coletivo Papo Reto. The night then proceeded onto the auction, featuring works of art, experiences and jewelry, proceeds from which will benefit more projects in Rio. One of the more memorable moments of the evening was when donor Tom Rosicki pledged to donate US$20,000 if all guests came together to sing “Samba do Avião”by Tom Jobim. Thanks to Mr. Rosicki, Ms. Paula Bezerra de Mello – who assisted Mr. Rosicki in leading the attendees, BrazilFoundation will be able to fund two additional projects in Rio de Janeiro. Musical artist Fernanda Abreu closed the night with a lively show, performing some of her hits including “RIO 40 Graus”.